Get ahead of your competition and in school – apply for one of the best internships in the country under one of the most known media pros in USA – Award-winning West Coast Correspondent for ODwyerpr.com, NY, Examiner, Technorati, CNN and Yahoo. Past GM for MAYO Communications. 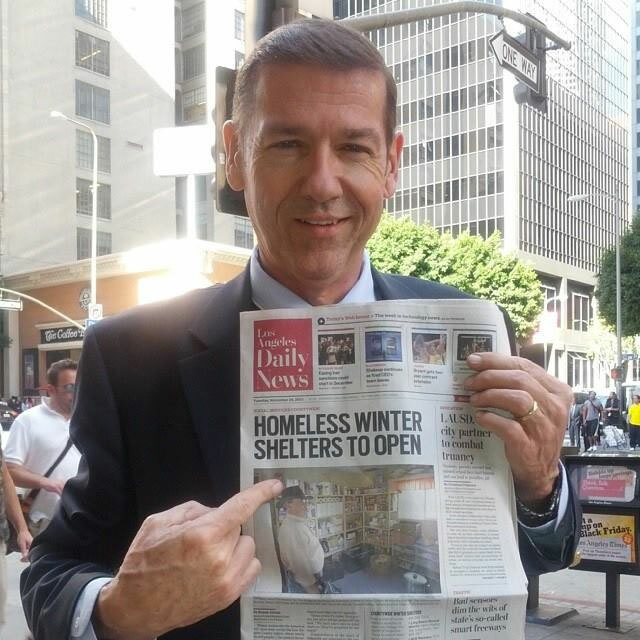 George McQuade displays his front page story about the Winter Shelter program published on the front page of the Los Angeles Daily News. LAHSA Paid Internship Program under George McQuade III, Director of Communications at the Los Angeles Homeless Services Authority. The Los Angeles Homeless Services Authority (LAHSA) Communications Dept. plans to add an Internship program to the Communications department (three interns), who will work 8 hr. shifts, 9:00 a.m. – 5:00 p.m. Mon- Fri. at LAHSA headquarters, 811 Wilshire St., Los Angeles, CA 90013. (downtown LA). The hours are flexible and LAHSA will work around the intern’s school schedule. Transportation (bus, train pass or monthly parking paid by LAHSA). You must be enrolled in school and be working on your Bachelor’s degree or higher, with a preferred major in communications, writing, English, journalism public relations and related field. Demonstrated ability to work social media platforms, including Google+, Facebook, Twitter, Instagram, Pinterest, YouTube, Blogs, etc. and have a passion for social media. Comedian Brian Vermeire takes social media to new heights. LAHSA is taking its communications to new heights and you can be part of it, too. Research, write articles, update media databases, monitoring news about LAHSA, help coordinate media events and provide support for external media campaigns in LA County. Assist in original content for the LAHSA.org website. Monitor social networks and assist in sharing LAHSA stories Online. Employee Communications, photography and newsletters: Provide support in writing, editing and pitching materials to the media and for other internal publications such as brochures, fact sheets and annual report. Ability to efficiently handle more than one project or task simultaneously under deadline, and complete a task with minimal direction or instruction. Ideal candidate has high quality standards, a strong work ethic and thrives in a friendly, fast-paced environment. College seniors preferred. but not mandatory. Deadline to aply: open until filled. Looking for multitask people, who know their way around the internet and are quick learners in internal and external communications. Please send a cover letter, resume and two writing samples (or a link(s) to your content online via blog or other projects you wrote) to gmcquade@lahsa.org. For more about Los Angeles Homeless Services Authority (LAHSA) visit: http://www.lahsa.org.